Over on my blog, I started a summer salad series where I’ve shared some of my warm weather favorites. I cannot let the summer go by without discussing a fruit salad. They are my favorites during hot and humid summers here in North Carolina! Growing up, when summers were their worst, my family always had some type of fruit as a cooling late night treat. I guess those habits have carried over into adulthood. These days fresh organic fruit is a staple in our household. My husband and I eat fruit any time of day: for meals, snacks or dessert. Our mornings start with a 6:30 AM workout followed by a fruit salad on a bed of fresh baby spinach. The picture above actually features the salad we had earlier this week…absolutely tasty. Aside from the amazing taste of this salad, it’s also great for my health. Particularly, as I get older I try to focus more on nourishing my skin from the inside out. I appreciate that inner glow that healthy skin gives off, don’t you? I like to include fruits, such as strawberries and kiwi, which are rich in Vitamin C. Vitamin C is great for keeping your skin taught and wrinkle free. In addition, the spinach and pineapple pieces are great for their antioxidant properties, which help fight the signs of aging as well. For that extra boost of antioxidants we drink organic green tea along with this salad. It’s the perfect end to a hard work out and a great start to the work day. To create this organic treat, begin by placing a handful of organic green spinach in the bottom of your bowl. 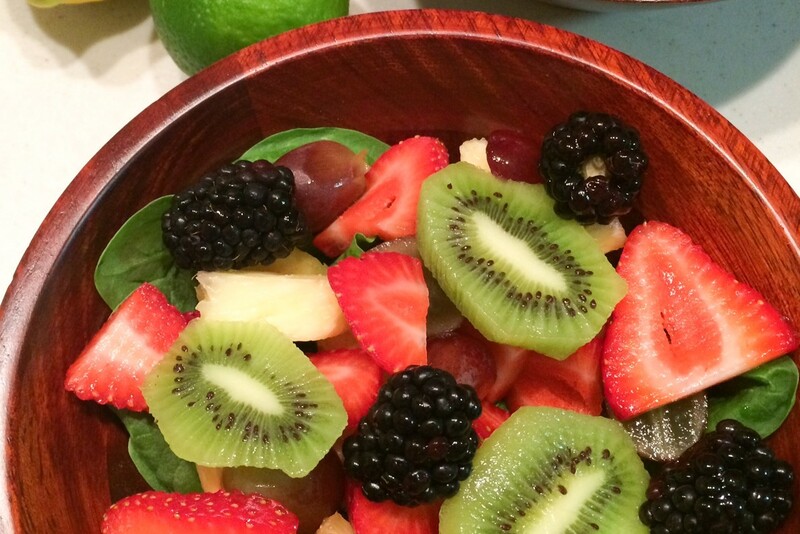 Top the spinach with pineapple pieces, grapes, strawberries, blackberries and kiwi (choose organic when you can). If you are using this salad as a dessert you may combine 1 teaspoon of lemon or lime juice with a tablespoon of honey. Drizzle this dressing over your salad and enjoy! Do you have any summer fruit salad ideas? If so, please feel free to share them below in the comments.